Crispy, tender grilled chicken wings with a Parmesan garlic sauce! 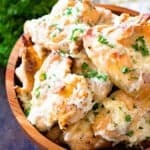 These Grilled Garlic Parmesan Chicken Wings are perfect for a quick party appetizer, tailgating recipe or a fun dinner! You'll be licking your fingers they are so delicious! Clean grill and preheat to 350 - 400 degrees F.
In a small bowl mix together wings, olive oil, salt, garlic powder, and pepper. Toss to coat. Place chicken wings on grill and grill for 25-30 minutes, rotating 2-3 times during grilling time. You need the internal temperature to be at least 165 degrees F. I actually prefer it 180-190 degrees F to make sure the meat by the joints is cooked through and you don't end up with any stringy chicken! When chicken is almost done mix together the ingredients for the Parmesan Garlic Sauce. Remove chicken wings from grill and place in bowl. Pour Parmesan Garlic Sauce over the chicken wings and toss to coat. Serve immediately. You can also bake the chicken wings in an oven preheated to 375 degrees F for 40 minutes.